Pipe Games - ArcadeGames.com - Play free arcade games. Build up the pipe before the water flows. 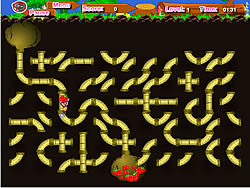 Later levels include pieces where pipe has to run threw.